Valerie Barrow channels Eiok: I am Eiok. I come with pleasure and I come with great energy because I want you to realise that you are on a mission, and for this reason, do not doubt what you have come to do, for you are under a contract. Does that make sense? I do not want to sound like I am ordering you, far from it, I am coming because I have been requested to come by Cosmic Sai Baba and he is the one that is overseeing the meetings that take place with you, which we are all interested in and which many other races are also interested in. I hope you understand my message and that it is not one to go against you but rather to assist you. I will keep the channels clear and that will make it easier for all of you to connect to your Andromedan future selves. God bless you my girls. We are all slightly shocked at the power of this message that came in a loud booming voice. Jill and I both experienced very strong vibrations in our chakras. Jill and I both felt a terrific shift. Some sort of alignment. Beyond our understanding. A burst and a clearing out. 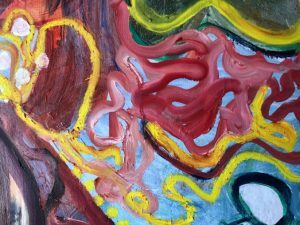 Valerie went on to say how she felt that in Andromeda the Angelic realms always seem to come in – boom – no emotion – strong creative energy. We then meditate , asking what we need to work with today. Jill felt almost shaky, overcome by the strength of the presence of Enoc. In her mediation she saw wires – connections – like telephone wires. Also parallel lines. Was also reminded about parallel lives, which Jacqui had been being shown about all the previous week. Val feels that they want us to bring up the subject of parallel lives. It was so powerful and the vibration was very high. I personally had very strong vibrations in my body, particularly my solar plexus and my throat chakra as well as my crown chakra. It felt like a wake up. I could have happily stayed in that space. I also found my body rocking – it felt very harmonious. Val intercepts saying – Andromeda created this planet and now, no more fooling around, they’re coming back, because the edict is for us to change and align with the central core of Suns. Leading to the Golden Age. Andromeda Val joins the conversation: Parallel lives exist in all ways, it is another way of expressing the existence of past, present and future and how it all happens at once. It might be a little bit hard for the human brain to get their mind around it, but from their soul consciousness and their over-soul they can easily connect to the fact that everything is recorded, everything past has not been left and disappeared, far from it. It is a matter of relativity and so that if you express a desire to find out about the history of a certain time, because you feel that perhaps you may have been involved in it, you can do this, because it is still there, and it only requires you to be totally centered and go out in your mind, your consciousness, which is everything. Your consciousness will link to the existence of what you are asking and you will be given information. You need to do this in altered state of consciousness, which you may say is an advanced state of meditation. It is that simple, and of course, meditation is linked with your inside eyes, which is the same as your experience when you have dreams or when you close your eyes and imagine you are somewhere and you can see everything happening and taking place. Imagination is the nation of images and so it is the world of light. And so you can tap in to past lives, or parallel lives. Lives that you may be living in another race at the same time as an aspect of you is living here in a human body on your Planet Earth. This can happen because the soul has a consciousness and it through there, almost like a radio station, that you can connect. You can connect to your over-soul. Which I could express as your Guardian Angel, it is always said that you have someone overseeing you and looking after you always at the time you have a body in a race, and in particular on Planet Earth. It is known and seen as a Guardian Angel and I am sure you can relate to that. It has been proven and shown many times, through co-ordinated instances that exist. Your Guardian Angel has and always overseeing you as a personality in a human body and a light body that connects to your soul, which also has a contract to may I say, play out a life here (on this planet) with a reason and a purpose always. You could say your oversoul is a bit like a passport, because everybody on Earth has one and it gives them the right to come into a human body that is forming and be part of the human race. It is sometimes said that a soul can be destroyed. That is not quite right, in that it is merely a way of the star people or the angelic realms in particular (who can be very blunt in the way they speak) and what they mean is a person can no longer enter into a human body on the planet Earth. Quite often it is because the planet Earth energy is too harsh for them to survive here. There are many reasons why people come and go. In the whole it is to hold the Light of God from Andromeda. I have said before that the Angelic Realms are the ones that actually created your planet Earth and the purpose was The Garden of Eden, meaning a place of Divine Love, of love and light in this very dark corner of your Galaxy the Milky Way. I have said this many times, it may be a little hard to imagine how we would have the technology to create a planet, but when you advance as we have, you would understand it is not difficult at all really. It is possible. So if you think of it as a possibility, that will help you to relate to the fact. The people from Andromeda, from the Angelic realms and those races that work with them, even in your galaxy, the Milky Way, they have done through the ages. The evolution of Earth has been part of their journey in helping and assisting the Andromedans. The journey of the human has been created also here on your Earth with purpose. It is a God being, you are all God beings in a human Earth body. You are part of creation. So how could you possibly deny you are God-beings? In the lower energy of the dimension of consciousness that exists upon Earth, it is a little harder to connect at times, but it is possible and I can say it is a reality. So your oversoul is the one that really knows and understands everything about you. Understand that and if you can accept then you can connect very easily, and the more you do so, the easier it will be to live your life here on this planet and achieve the contract that you have made before you have come. Everybody has come with the addition in the contract to help one another. Certainly that means all races that have now separated in your human race. You are all the same blood, you are part of the animo-man and if I can correct myself, part of the ape race, way back in time, which has gone off on another journey of its own. The animal man also exists and is part of your DNA, and remains also in the next world and then also the animal man has been raised in consciousness by the “star” genes. The star-people’s genes. The ones that are God beings that have lifted the consciousness of man to Hu-man, which is Light-Man. A Light Being, A God-Being. One that is able to think and resolve all issues and help each other to raise in consciousness so that you find Peace and Love and Goodwill in helping one another. So this my friends, is part of the parallel existence of other beings because part of you may be in a parallel life in another race within shall we say your Galaxy which has perhaps has more of a cold blood, more of a not understanding your feelings, and experience and pain and not knowing what love and compassion really is. There is all a reason for parallel lives. Thankyou. God Bless You. 3 Oms to close, Shanti Shanti Shanti. Listen to the sound byte, as it is a new presence. It was so powerful and the vibration was very high. I personally had very strong vibrations in my body, particularly my solar plexus and my throat chakra as well as my crown chakra. It felt like a wake up. I could have happily stayed in that space. I also found my body rocking – it felt very harmonious. 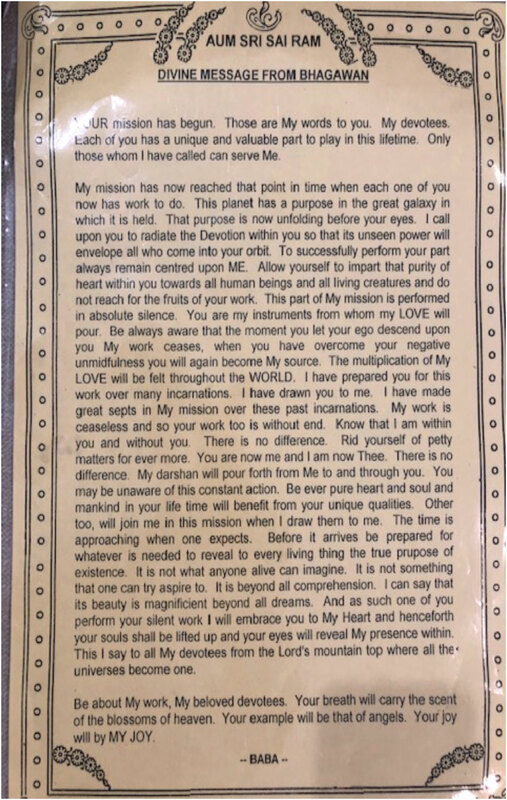 I also relate very strongly to the “mission” statement made Enoc, (as the woman that set up the first Sai Centre in Sydney, Australia, the beautiful Pushpa Apana, once gave me a mission statement that she said was from Sai Baba, just after I had seen him in his light body at her house/ashram in Rydalmere. It was 1995. That mission statement reduced me to tears and such a feeling of connection, even though I didn’t understand it at the time). Truth resonates.